Funeral Insurance- Not Easy but very necessary…. Liberty Seguros has launched a very interesting Bespoke Funeral Insurance, which I thought may be interest to my clients. Never easy to think about your funeral, but of so necessary. Death is always a difficult subject to discuss, but when living in Spain, it becomes far more important to think about the future and how to make this stressful time easier for your loved ones. With this in mind, at Jennifer Cunningham Insurance, we are delighted to introduce a Bespoke Funeral insurance package, at an astonishing starting premium from € 70 for the whole year. For the Spanish, funeral insurance is more or less a necessity and is taken from a very early age. Funerals are very expensive and will put an enormous amount of pressure on your loved ones. Before any arrangements can be made, it is necessary to have a NIE number, your bank accounts may be frozen and the paperwork completed, which all makes it far more difficult for your family. Funerals plans can be made in one payment or a deposit and the remainder paid over 5 years, with interest added. This option is an excellent choice. However, it may not be the correct time financially to commit to this option. You may have an investment coming to you in the future but what if something happens before then, or your income may not be able to stretch this far? Liberty Seguros have introduced an amazing funeral insurance, a Bespoke package that gives you the choices to tailor make the insurance to your needs and those of your family, at an affordable yearly premium. There is just no reason not to come and talk to my consultants now, for the best way for you to protect your loved ones. If you wish to ensure that your family has more financial protection on your death, Bespoke Life Insurance is further option. This also can cover the cost of the funeral and provide the necessary funds to cover other outstanding costs. Another excellent option from Liberty Seguros is the Accident Plan, which protects you in so many ways. For more information email info@jennifercunningham.net or visit the website www.jennifercunningham.net. Well, where do we begin? It has certainly been an interesting quarter, with endless developments on Brexit (“the gift that keeps on giving”), the ongoing tariff disagreements between the US and China, and the increasing problems Italy and their economy are experiencing. Brexit, without doubt, is the most known and spoken about topic, as we simply cannot get away from the news – even if we wanted to. This is also the most relevant subject to the majority of us living here in Spain, as, depending on the outcome, it could have a direct impact on us, especially if there is a no-deal scenario. This, as we know, is not a certainty and there are many people who still believe that the UK will not leave the EU if there is a strong campaign for a second referendum. Over the past 3 months we have seen Theresa May suffer a humiliating defeat in the House of Commons, which led Mr Corbyn to table a vote of no confidence. The PM survived the vote of no confidence the following day, and pledged to return to Parliament with a revised deal which she believed would pass. This didn´t quite go to plan, and the PM now has to head back to Brussels and attempt to re-negotiate her deal. The early indications are that this will not be easy, with the EU seemingly holding its ground and dismissing any possibility of a re-negotiated deal. Importantly, from an investor´s point of view, we do believe that the possibility of a “no-deal Brexit” has already been accounted for in the market. As many of you are aware, we speak with discretionary fund managers from the likes of Rathbones and VAM on a regular basis, and they have echoed our sentiments. Markets suffered badly the second half of 2018, mainly due to the unknown outcome of BREXIT and, as time passed by, the increasing likelihood that there will be no deal. Markets tend to be more volatile in times of uncertainty, compared to times of a known outcome (whether this be a good outcome or not). The start of 2019 however, has been positive. Following the two parliamentary votes, and the conclusion that Theresa May will be revisiting Brussels, there is new hope we can avoid a no-deal scenario. Despite ongoing volatility, this has boosted the majority of European Markets to post positive returns for January 2019. Based on our view that a no- deal Brexit has already been accounted for in today´s market, perhaps the biggest threat to investments, and subsequent fund performances, rests with whether a trade deal can be agreed on between the US and China. China and the US are engaged in a trade war as each country continues to dispute tariffs placed on goods traded between them. The disagreement has been known for a number of months but there is now a deadline of the 1st March 2019, at which point both countries hope to agree on a deal. President Trump, in typical Trump style, has handed out numerous threats since the start of this disagreement, with the latest comment from his admin team being “if, by the 1st March, the parties are unable to reach an agreement, the 10% tariffs will be raised to 25%”. From an investment point of view, we hope that a trade deal is agreed upon, as this will bring some stability to the market and should, in theory, benefit equities throughout 2019. This then brings us to Italy. Italy has now fallen into recession after its economy shrank by 0.2% during the last quarter of 2018, its second consecutive negative quarter. Italy’s economy has been weakening since early 2017 and has recently been hit by a slowdown in key trading partners, including Germany and China. The country’s government has also been involved in a fight over its budget deficit with Brussels. Critics say this has damaged market confidence, pushing up Italy’s borrowing costs and hurting the economy. Having said this, Italian PM Giuseppe Conte said on Wednesday that conditions were in place for a recovery over the second half of 2019, but we will wait to see if this comes to fruition. From an investment point of view, we do not believe that this will be a major drag on the market, for the time being at least. The Modelo 720 is an informative declaration made to the Spanish authorities advising them of any asset an individual holds outside of Spain, with a value of 50.000€ or more. This declaration has to be made before the 31st March and is in relation to the value of the assets as of the 31st December the previous calendar year. Modelo 720 has 3 reporting categories, split into bank accounts, investments and immovable property and the threshold of 50.000€ applies to each. If the asset in question is in a different currency, the exchange rate will determine whether or not there is a need to declare. For example, if an individual has 30,000 pounds in a UK bank account, this would not need to be declared as with the current exchange rate, the euro equivalent would be approximately 34,200€ and therefore short of the 50.000€ requirement. Many individuals have bank accounts or investments that are held in joint names with a partner. If this is the case, each person must declare the asset as if they held it individually, stating the full amount and their percentage of ownership. 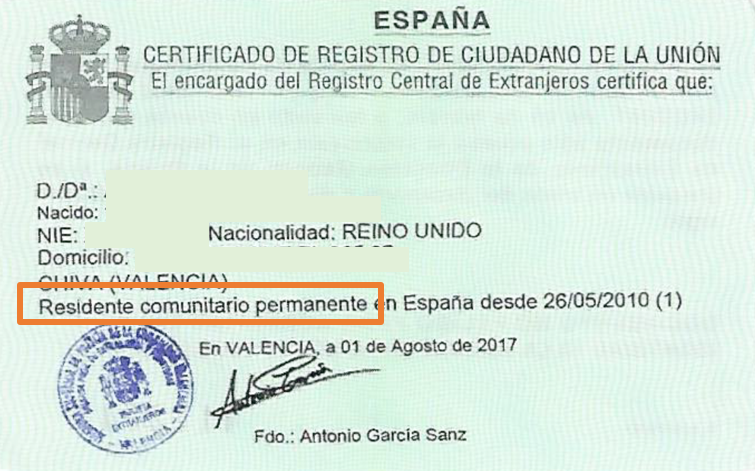 Any asset held within Spain does not need to be declared as it will already be known to authorities. Once an asset has been declared, there is no need to declare again in later years, unless the value of the asset has changed by more than 20,000€ or the asset has been sold or closed down. As with many declarations worldwide, there are fines that an individual could face if they fail to provide the information requested. These fines could be imposed due to late submission of the declaration or for misleading or false information. During volatile markets, there is often an urge for investors to try and “outwit” the market by attempting to sell investments ahead of big falls, or buy investments just before a significant rise. Unfortunately, this is nigh on impossible to predict and although we may be lucky enough to disinvest from the market at the perfect time once, it will be impossible to always get it right. It is also not uncommon to hear investors say that in a gradually falling market, we should disinvest as early as possible. Once again, the right time to do this is extremely hard to predict – hindsight would be a wonderful thing. We have seen numerous examples over the past few weeks and months where a global market has been steadily falling over the short term, but then bounces back with big gains on a particular day. One of the investment companies we work with, Castlestone Management, carried out an analysis of the S&P 500 (Index of America´s top 500 companies) over the last 20 years, and the results made for some interesting reading. If an investor had stayed fully invested over this time period, they would have received an annual average growth of 7.20%. If the same investor had missed just the 5 best days over this entire 20 year period, they would have received an average annual growth of 5.02%. If the same investor had missed the best 10 days over the same period, they would have received an average annual growth of 3.53%. If they missed the best 20 days, the average annual growth would drop to 1.15%, and missing the best 40 days would actually put them into a negative loss of an average -2.80%. These results are quite astonishing considering we are studying a 20 year time period, and only a maximum of the best 40 days missed. There is a saying in the industry which has never been more true having read these results; “It´s about time in the market, not timing the market”. Sterling has made a strong start to the year, strengthening by around 4% since 1st January. This positive news for the pound is down to the expectations that Britain can now avoid a no-deal Brexit. There is a strong belief that even if Theresa May returns from the new negotiations in Brussels empty-handed, the prospect of a fresh set of amendments being debated in London on the 13th- 14th February will support the pound. The assumption that we can avoid a “no-deal” Brexit has prompted the GBP-EURO rate to hit its highest level since 2017, which currently stands at 1GBP/ 1.421€. Over the pond, the dollar has experienced contrasting fortunes, weakening after the Federal Reserve pledged to be patient with further interest rate hikes. Although the Fed left interest rates unchanged last night, which was expected, they did discard their promises of “further gradual increases” in interest rates. Following this news, the dollar has fallen to a 3-week low against other major currencies, currently standing at 1GBP/1.3124 USD, and 1€/1.1468. Are you Modelo 720 Ready? to be declared as it will already be known to authorities. Modelo 720 has 3 reporting categories, split into bank accounts, investments and immovable property and the limit of 50.000€ applies to each. If the asset in question is in a different currency, the exchange rate will determine whether or not there is a need to declare. For example, if an individual has 30,000 pounds in a UK bank account, this would not need to be declared as with the current exchange rate, this would be equivalent to approximately 33,000€ and therefore short of the 50.000€ requirement. Many individuals have bank accounts or investments that are held in joint names with a partner. If this is the case, each person must declare the asset as if they held it individually, stating the full amount and their percentage of ownership. http://www.expatservicesspain.net/wp-content/uploads/2017/08/expat_services_logo_150h_trans.png 0 0 Jennifer Cunningham http://www.expatservicesspain.net/wp-content/uploads/2017/08/expat_services_logo_150h_trans.png Jennifer Cunningham2019-01-23 14:56:022019-01-23 14:56:02Are you Modelo 720 Ready? 31st March is the deadline by which residents in Spain need to submit their annual Form 720 (‘Modelo 720’) listing their overseas assets, where applicable. If you have previously submitted a form, you only need to declare assets if they have grown a certain amount or you have sold or closed them. Besides confirming what you have to declare this year on Modelo 720, this is also a good time to consider whether you are holding your assets in the most tax-efficient vehicles for Spain. If you have investments that were set up with UK taxation in mind, you may be paying more tax in Spain than you need be. Modelo 720 has three reporting categories, based on bank accounts, investments and immovable property. You have to report all assets in a particular category if the value of your total assets in it amounts to over €50,000. This only applies to assets located outside Spain. In general, you are obliged to report assets if you are the owner, a settlor of a trust, an effective beneficiary from a trust, authorised signatory, or you have the authority to dispose of the asset. This includes assets held by a company, trust or fiduciary. You need to report even if your personal share of assets is less than €50,000. With joint assets, each owner needs to declare the full value (not pro-rated) and indicate their percentage of ownership. In most cases, assets are valued using the wealth tax rules as at 31st December each year. For assets held within financial institutions (eg bank accounts), you also need to declare the average balance over the last three months of the year. You need to report the value of the assets in Euros, so any investments held in other currencies need to be converted using the official exchange rate as at 31st December of the relevant year. We can help.. We have trusted associates who can ensure your assets are in order and declared correctly. http://www.expatservicesspain.net/wp-content/uploads/2019/01/modelo-720-830x648.jpg 648 830 Jennifer Cunningham http://www.expatservicesspain.net/wp-content/uploads/2017/08/expat_services_logo_150h_trans.png Jennifer Cunningham2019-01-07 11:27:122019-01-07 11:27:12Are you Modelo 720 ready? Healthcare isn’t usually straightforward and when you add insurance into the mix, it gets even more complicated. When you’re headed to a new country, there are going to be new rules, new regulations and new forms to fill out before you can receive treatment. If you’re headed to Spain, you’re in luck: they have one of the best public healthcare systems in the world. But just because they have a strong public health system doesn’t mean you can’t or shouldn’t get insurance. Whether you’re packing up to move or have already settled in, this article will help you understand how to access and use health insurance while living in Spain. What kind of healthcare system does Spain have? SNS doesn’t cover every health expense though. For example, ambulances, dentists and pharmacy costs are additional out-of-pocket expenses, where individual payments are used to supplement the full price of the services. Private insurance can be an alternative to cover these added expenses, but it’s good to keep in mind that the insurance company will often limit the list of services that are available and also have a list of prefered care providers you can visit. Make sure to check with your insurance company about this before you visit a specialist. Spain’s universal healthcare system, SNS, ensures that no citizen or long-term resident goes uninsured. Spain’s constitution actually requires that the state provides medical care for all basic and preventative care. For European travelers, the European Health Insurance Card (EHIC) will enable you to access the necessary SNS healthcare in Spain at a reduced cost, or sometimes for free if you’re on a temporary stay. Once you plan on staying in Spain for a long-term basis, you should register for their SNS coverage or purchase private insurance. If you’re a visitor, remember that all non-EU or UK travelers (US and Canada) should already have valid health insurance coverage prior to obtaining a residency visa. Because Spain’s health insurance system is considered universal, there are no citizens or long-term residents without access to emergency health care. All foreigners and citizens have a right to be served for emergency or urgent treatment in Spanish hospitals, no matter your insurance coverage or whether or not you have a general practitioner. EU residents can have free healthcare for the first three months under their EHIC. After that, you’ll need to look into either private insurance or registering for the public option. You can register into the public option by starting to contribute to the social security system. Cautious travelers are always welcome to purchase travel insurance. Having travel insurance will protect you in the event of an emergency. These plans can be tailored to your needs, so if you’re just visiting for school or vacation, they may work out to be your cheapest and most risk-free option. While there’s always access to healthcare for all Spanish citizens and residents, not having the right coverage can cause some delays in needed services. For example, some providers may not serve long-term stay foreigners who have yet to transition from their EHIC coverage to Spain’s universal SNS coverage. Additionally, there’s a distinction between private doctors and health centres versus public facilities. Only the public facilities will provide free care; the private providers will add extra fees if you don’t have the correct insurance. Because of Spain’s widely recognised free and universal healthcare coverage, not many citizens or long-term residents use private insurance. 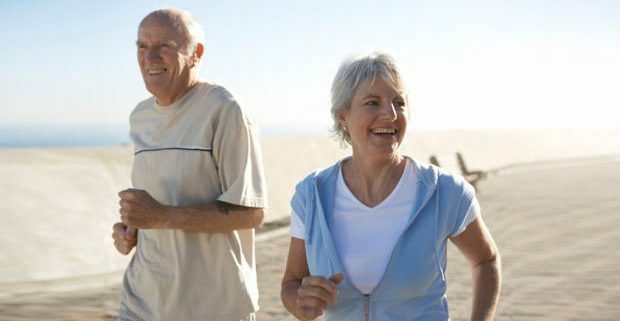 However, the coverage can be helpful for those with special health needs, to aid in additional coverage with prescription drugs, for dental care, or for expats who don’t qualify for the public healthcare (for instance when you don’t work or haven’t reached the retirement age yet). We can help with all your requirments and also assist with the transfer of any existing policies you may have by offering extra special conditions, similar terms and conditions and a more comprehensive medical directory of English speaking doctors. BRITISH expats aiming to be ‘Brexit Ready’ ahead of March next year are increasingly asking about their status as ‘permanent’ residents. The current road show being staged by the British consulate team aims to answer personal questions over the UK leaving the European Union, a move scheduled for March 29, 2019, – although an agreed deal is likely to involve a transition period. 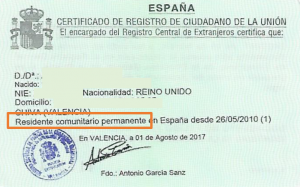 However, there are a number of questions about whether the word ‘permanente’ – or ‘permanent’ – is needed on either the large green paper certificate or the smaller version. The Embassy has now provided us with a clear answer. 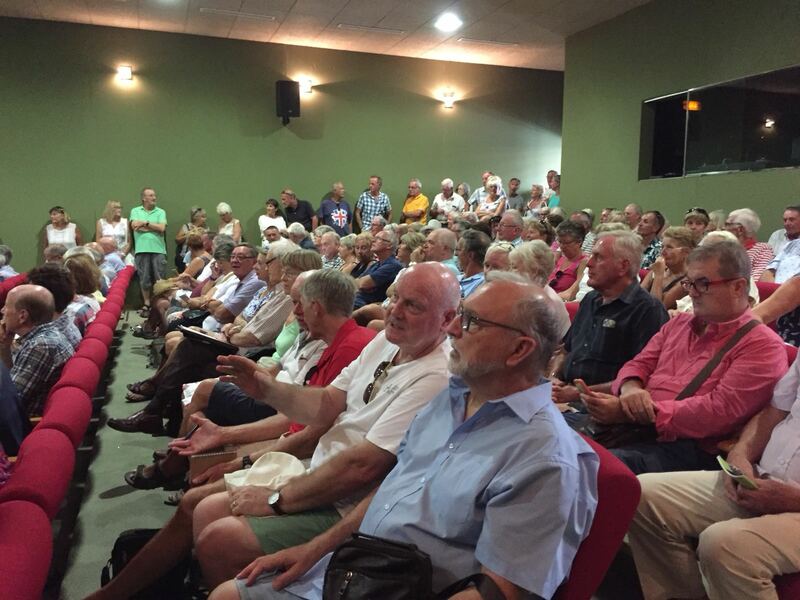 HMRC representatives from the UK visited Moraira and Rojales yesterday to talk about tax issues. 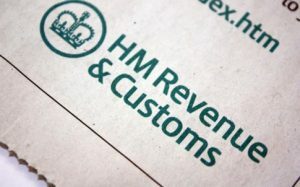 HMRC has introduced new legislation that requires individuals to make sure their foreign income and assets are in order before a 30 September 2018 deadline and the arrival of tougher penalties. There are two scenarios where a penalty could be imposed; either because of deliberate non- compliance (people trying to get away without paying taxes by not informing HMRC of things on purpose) or because of an error resulting in non-compliance (incorrect information given to HMRC). Penalties are currently 30-40% on top of tax amount due up to end of September. But from 1st October this is increased to 100-200%. You can however avoid this penalty if you have a “reasonable excuse” , for example you went to an accountant and he calculated your tax liability incorrectly and as a result the wrong amount of tax was paid due to their error. These regulations only apply to Spanish tax residents if; they have income derived from a UK property (rent) , if they have income derived from a UK civil service pension or if they have sold a piece of art/jewellery or house in UK. The 30th September deadline is to inform HMRC. People then have a 3 month window to actually make the correct changes if needed. Welcome to our second quarterly newsletter provided by our fantastic financial associates. Having launched this quarterly update for the first time back in late April, we are pleased to say that we have had lots of positive feedback. As always, if there is any topic you would like them to cover in our next update, please do not hesitate in letting us know. Over the past 3 months we have seen many events worldwide that will make their way into the history books, both political and non-political. On the political side, we have seen important meetings such as the North Korea-US Summit 2018 in which Donald Trump and Kim Jong-Un met for the first time in person, in Singapore. Mr Trump then did a European tour during which he first visited her majesty the Queen at Windsor Castle, before flying to Helsinki to meet with Vladimir Putin. On a lighter note, we have also had been treated to a very well organised (and violence free) World Cup in Russia, much to our surprise. From an English perspective, it was great to see everyone come together and celebrate the success in reaching a semi-final, despite the continued divide in political views. During the quarter, global markets once again showed their volatility, keeping up with the trend set at the start of the year. For many indices, this quarter has been a very positive one, with the FTSE 100 as an example, posting its best quarterly return in 15 years, for the three months leading up to June 30th. It has not all been good news though, and one of the main sectors affected negatively in this quarter was emerging markets; the MSCI Global Emerging Market equities declined by 4.2% in June alone. The reason behind this mini crash was due to emerging markets being vulnerable to a strong dollar and rising interest rates. The Federal Reserve hiked rates by 0.25% in June, which was widely expected by the market, following strong macroeconomic data. However, the Federal Reserve changed their forward guidance to include two additional rate rises in 2018 and then another three in 2019. If implemented, this would take rates up from the current 2.0% to 3.25% which would be the first time in a decade that US dollar cash would offer a positive real return. In Europe, the ECB (European Central Bank) moved to a slightly more relaxed monetary stance, deferring the end of its quantitative easing programme to the end of 2018 and announcing there will be no change in interest rates until the summer of 2019 under forward guidance. It has been a tough year for the EU, not only due to BREXIT, but also because of the political unrest and increased threat to the long-term stability of the Eurozone. Italy is a prime example of this with their government split between Eurosceptic populists (winners of the March elections) and pro-EU establishment politicians. Fortunately, on a wider scale, the global economy is in good health, with macroeconomic data pointing to a pick-up in growth after the soft patch experienced in the first quarter of 2018. Inflation remains relatively subdued, with the biggest threat to inflation coming from the US, where the economy has been performing strongly and is being supported by accommodative fiscal policy from tax cuts and additional government spending. Whilst on the US, it is fair to say that we could write a whole newsletter on Donald Trump alone each quarter, as his unpredictable character and let’s say “unique personality” never lets him get too far away from our TV screens. With this said, arguably the most important news headline of this quarter was the potential trade war between the US and China. At the start of July, both Washington and Beijing launched import tariffs on 34$ billion of each other’s goods, and while economists say the consequences of the spat between the world’s two largest economies can be contained for now, there are fears that Donald Trump’s stance on trade could cause serious damage to the global economy. It is possible however, that Donald Trump is seeking political gain ahead of the mid-term elections in November and is using empty threats in order to extract concessions. Looking ahead, the geopolitical issues mentioned above will have a key role in deciding market movements and it is our view that markets will remain relatively volatile for the foreseeable future. The biggest problem with a potential trade war, the threat to the long-term stability of the EU, and the developments (if any) of BREXIT, is that they are all longer term issues and will not get resolved over night. Whereas an interest rate change happens pretty much on a set day/time and can affect markets temporarily, the negotiations of BREXIT or a trade war will inevitably have an ongoing grip on the market. For many, this is turning into a long-winded, boring and tedious subject. The fact that the Government (now 2 years after the vote) is still arguing amongst themselves, says it all. The deadline for BREXIT is set as the 29th March 2019, at which time the transition period will start, running up to 31st December 2020. Some EU negotiators are doubtful that a full UK-EU deal will even be achieved at this point. In early July, the Cabinet was torn apart by disagreement over Theresa May’s “third way” BREXIT strategy, unveiled at the Chequers country estate. Her plan was to aim for a divorce similar to the set up of Norway – part of the European Economic Area and trading bloc, but with some opt outs for justice, immigration and regulation. Essentially, this would mean the UK would have to simply obey many European rules without having any say in their creation. It return, the UK would have access to the Continental market tariff-free. Following this development, several senior ministers, including BREXIT secretary David Davis, resigned. Brexiteers are upset because it’s not really a BREXIT at all. Europeans are upset because it appears that the UK is trying to pick and choose which rules it will and won’t follow. Remainers are upset because the UK is simply giving up a commanding seat at the EU table for a complicated patchwork that leaves things virtually as they were. All in all, everyone does agree that it is a shambles. In light of the above, an increasing number of people have suggested the idea of a second referendum. This has been backed by a select number of ex-Cabinet members and also some famous celebrities such as Gary Lineker. There was also talk only two weeks ago about the possibility of a second referendum with three options; to leave the EU with no deal, to leave the EU with the PM’s final negotiated deal, or to remain in the EU. Whether or not a second referendum is a genuine option is yet to be seen, but Theresa May, up to this point, has repeatedly stated “under no circumstances”. We are taking a very different view on BREXIT and how to inform clients. We have seen a lot of our competitors run seminars, or advertise on the radio or in magazines, claiming to inform clients of what will happen. Many of the adverts are also used as scaremongering tools, something which we do not agree with. The truth is nobody knows what is going to happen with BREXIT. It is impossible for anyone to say whether or not a deal will be finalised, because we simply don’t know. If the Government don’t even know themselves, how can we be expected to know? What we do know however, is the position as of today, and thanks to our flexible financial solutions, we can make sure your finances are in order so that it doesn’t matter if it is a hard or soft BREXIT. The latest Spanish budget was originally planned for approval in September 2017, but due to political instability in Spain and the lack of sufficient support to pass the budget, it had to be postponed. Although no budget was planned for 2018, the 2017 budget has automatically rolled over until the middle of this year. On the 23rd May, the Spanish Congress finally approved the 2018 budget after weeks of hard negotiations. It has also now been approved by the Senate and was published in the Spanish Official Gazette (Boletin Oficial del Estado – BOE) on 4th July 2018. The most important point to take from the 2018 budget is that it did not include any major tax changes and will have minimal impact on UK nationals resident in Spain. Wealthier residents may be affected by the extension of wealth tax for at least one more year, though this was expected. 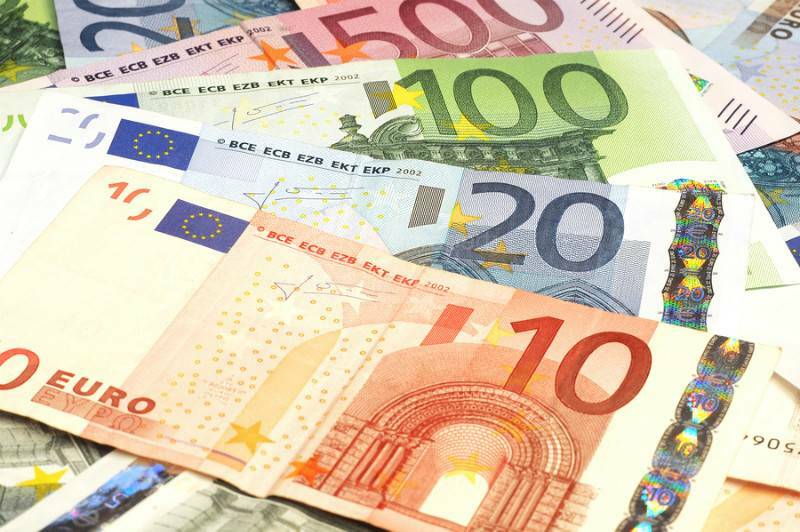 The income tax return threshold has been increased from 12,000€ to 14,000€ gross per annum. So, in simple terms, if your annual income in 2018 is less than 14,000€, you do not need to submit an income tax return. Wealth tax has been extended for yet another year and is applicable for the tax year 2018. The minimum widower and state pensions have been increased by between 1% and 3% depending on the case. There is a new 30% deduction for taxpayers who invest in new companies, up to 60,000€ per annum. The tax-free threshold for Spanish lottery winnings increases from 2,500€ to 10,000€ in 2018, 20,000€ in 2019 and then 40,000€ in 2020. The VAT rate for cinema tickets drops from 21% to 10%. Paternity leave increases from four to five weeks. Investments & Protection are two key areas that IFA’s should address when carrying out a financial planning exercise for clients. Protection, in the form of insurance, is one of the most undersold and undervalued areas in our opinion. All too often we hear news about a family member passing away and leaving their loved ones in a difficult financial situation. Some of these cases however, could be resolved with forward thinking, in the shape of Life Assurance. Life Assurance nowadays is pretty cost effective and plans can be paid for monthly, semi-annually or yearly. Aside from the idea of leaving your loved ones with a lump-sum, these types of plans can also be used to cover any expected IHT tax liability upon death. The same could be said for funeral plans and Wills. The cost of a funeral has more than doubled from an average £1,920 in 2004 to almost £5,000 in 2018. If the cost continues to rise at this rate, in the next 4 years it looks set to cost around £7,000 (an increase of 160% since 2004!). Having a funeral plan in place and also a valid Will, will make the administration and cost on death much more manageable for beneficiaries during such a stressful period. Investments on the other hand can come in all shapes and sizes, and can range from platforms/bonds, to direct investments. When analyzing to see if investments are suitable for clients, it is often important to look at where the investment is held, and where the client is tax resident. A good example of this would be when a British expat holding an ISA (Individual Savings Account) in the UK, moves over to Spain and becomes Spanish tax resident. ISA’s are great investments as returns are not liable to income or capital gains tax, and tax-free withdrawals can be taken at any time. However, this only applies to UK tax residents, and once an individual changes to become Spanish tax resident, the investments loses all tax benefits. Any income taken from the investment would then be added to total income and taxed at their marginal rate. Our associates are able to carry out a full review of your financial investments. They will then sit down with you and explain exactly what your money is invested in and also explain the tax position surrounding the investment itself.